I received a lot of interesting comments and questions on myprevious Jelly Wellies Rain Boots for Dogs post that I thought I would talk about them a little more and answer some of your questions. The big question was "Do I like wearing them?". Well, they do take some getting used to so don't be surprised if at first you cannot walk properly. I am still adjusting to mine. Would they be good for muddy paw syndrome? I would say, "Yes! Absolutely!" so long as you get used to wearing them. They definitely protect your feet well with 100% waterproof protection. Can they be used to protect paws from the hot pavement? Yes they can. Jelly Wellies are made from Silicon which will protect your paws from the scorching pavement and/or beach sand. Do they make your paws sweaty? Well, if you are using them for a walk in the rain, not really. I have not tried them for a sunny day walk as yet but I would think they wouldn't make your paws sweaty if you used them on a limited basis. I wouldn't wear any type of paw covering all day during the Summer since cooler paws helps us stay cooler in the heat. Do they stay on your paws? Yes so long as you secure the Velcro strap tight enough. I was able to kick one Jelly Wellies boot off but that was because Ma didn't get the strap secured tight enough. Where can I find Jelly Wellies? Currently, Jelly Wellies Rain Boots for Dogs are available at Amazon (CLICK HERE). In the Fall, they will be available in other places so I will keep you updated! Now, my friend at Jelly Wellies Rain Boots for Dogs was so excited about all your great comments and questions on my last post that she has offered one (1) Oz the Terrier reader a chance to win their choice of size and color Jelly Wellies Rain Boots (set of 4). Giveaway is open to U.S. residents only (sorry friends elsewhere), age 18 years or older. The Rafflecopter giveaway will close on July 29, 2015. Good luck! It's Black and White Sunday hosted by Sugar the Golden Retriever and Dachshund Nola! that wellies are great for pups who dislike rain (like me)...I totally hate to get wet paws and my mom hates it when I dry my paws on her pants.... that wellies rock, Dr. Oz! we love the name for sure but we do think they would make for sweaty feet when it is warm. My boots have mesh sides and I still get sweaty feet in them. Oz that's a great idea for pups who walk on hot pavement or hate the rain. I was glad to see the advice about remembering that dogs cool off partly through their paws. Toby has 'paws of steel' and we avoid the beach in summer (weird, I know) so we'll let others enter the giveaway. Good luck to all the entrants! Those look like some really great boots. Cool giveaway! You look so cute in those! OMD you look so cute in your jelly wellies!! Mr. Matt hates wet grass in the morning so we might need to look into getting some of these. I have been trying to decide about getting some of these for Bentley. It is so hot here and we take our walks at 8:30ish each night. He really needs some for the hot pavement. Mom's skeptical I'll tolerate them, but those sidewalks ARE awfully hot! Those look really cool Oz! I'll enter your giveaway for Shiner. I'd probably use them for grass or mud. Mine wouldn't appreciate wearing these, but they do look like a good idea! I entered but really hope I do not win cuz I don't think I would like wearing them BOL! They look very cute on you! SHE thinks the scotties might need a whole Jelly suit. 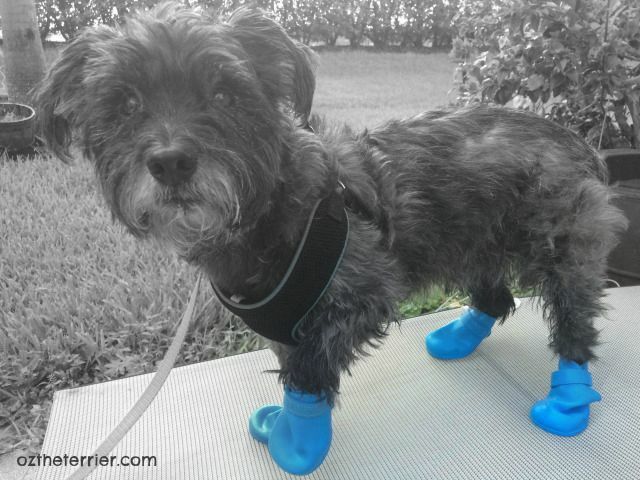 Oz, you sure know how to rock your blue booties. I would use them for walking on hot pavement. Being a service dog escorting ma everywhere there are some places that we can't wait till the evening to go (like her doctor appointments). Trying to find a spot close to park can sometimes be impossible. Ma has to use the valet parking to avoid me walking across the parking lot. I wouldn't use them while in my house but it would sure help when we are out and about. As for the mud.... mud baths are great for poodles curly hair! At least that is what I tell ma. BOL! Better you than us, Oz! My mom tried to get me to wear some when I was even a smaller puppy due to a paw injury, but I wanted NO part of them! We did our 8 happy things today! I am SO excited that you're giving some of these away! I have been very curious to try them for myself. I want pink ones for walks in the rain! My chiwawa Josie would wear these when it rains and for hot pavement. We would use these for rain, mud, rocks or hot surfaces. Very cool! Have been wanting to try these. Oh you do look so cute in them! I would use them for walking on hot pavement as that is what we have here out in the county to walk on when we go for a walk. Those are a great idea - especially for the hot pavement. I'm careful in walking Abby to stick to the grass during the summer time. Those are fabulous!! Way to keep those paws safe pal! I would use them for both! Your face is priceless Oz :) You do rock your Jelly Wellies though! I would use them for the rain. It rains a lot in OR lol I would also like to try them when walking my dog who has grass allergies. Thanks for the answers Oz. I am slowly catching up after and illness.